After class, I learned more of her story. An Egyptian asylee, she needed to call the immigration office to check on the status of her husband and son’s paperwork to join her here in America. They’d been separated for a year – her in the US with their two-year-old son and her husband in Egypt with the five-year-old. We chatted while waiting on hold for the government agent to answer. She explained that she was a Christian asylee, that her husband had sent her to the US ahead of him because of high persecution of Coptic Christians in their region. “It’s no problem,” I assured her. Imagining myself in her shoes, I was struggling to maintain my composure. There’s usually so little I can do to help in such situations that I was grateful to be able to help through something as simple as a phone call. The government was predictably slow, so we chatted more about her life, her family, how to survive two-year-old drama. An agent answered, but the details were complicated, so we had to call another number. She apologized again. Still no answer on the other end of the phone. 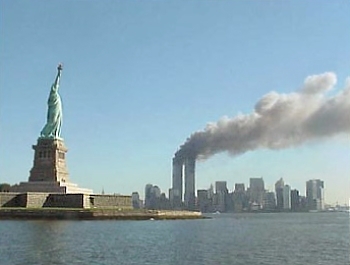 We recalled our reactions and shock, agreeing that 9/11 had forever changed the world we both knew. The conversation shifted to middle eastern politics, the tragedy in Syria, Obama, the accuracy of news media and all sorts of topics far beyond my knowledge and her language capacity. We agreed that war is terrible and that it’s often difficult to tell who’s right or wrong. Finally, we both ran out of words and the conversation grew silent except for the bad telephone-hold music. “You like this music, teacher?” she asked. “Not really,” we both chuckled. “I’m so sorry this take long time,” she apologized again. “Do you have anyone here who can help you?” I inquired gently. It was a holy moment, a little story shared by two mother-hearts who understood. The immigration agent never answered the phone. We ran out of time to wait and parted ways to pick up our children. 9/11 has lingered quietly in my soul all day. I didn’t bring it up at all in my class of so many cultures, languages, and religions mostly because I didn’t know what to say, how to speak of such complex tragedy in simple words among such diversity, but the gift of this unexpected interaction pushed that unspeakable day back to the forefront of my mind. As I drove to my kids’ school, grateful for simple freedoms of togetherness and safety, I reflected on the hard, sad stories of this day – stories of unimaginable loss and painful separation. With the Egyptian mother’s voice echoing in my heart, I realized slowly that such stories tell themselves every day, albeit on a much smaller scale. I could probably write a glimmer-of-hope stories like this almost every week, stories where hope sneaks in to overshadow despair, but I don’t always notice them. “We scatter light”, the motto of a Christian school in a predominately Buddhist country where my mother-in-law used to be principal, these words have been randomly inserting themselves into recent moments, whispering me toward small acts of kindness like letting people go in front of me in line, chatting with a store clerk, and today, waiting on hold to help out a mother longing to hold her child again. The light might not always shine brightly in the face of the darkest moments, but scattered about, it may offer a much-needed glimpse of hope at just the right time. thanks for sharing such a heartfelt story. i work with mostly refugees and immigrants and the circumstances are often similar. may God be with you in your work and sustain you throughout.